The Digger Archives is an ongoing Web project to preserve and present the history of the anarchist guerrilla street theater group that challenged the emerging Counterculture of the Sixties and whose actions and ideals inspired (and continue to inspire) a generation (of all ages) to create models of Free Association. The Diggers were one of the legendary groups in San Francisco's Haight-Ashbury, one of the world-wide epicenters of the Sixties Counterculture which fundamentally changed American and world culture. Shrouded in a mystique of anonymity, the Diggers took their name from the original English Diggers (1649-50) who had promulgated a vision of society free from private property, and all forms of buying and selling. The San Francisco Diggers evolved out of two Radical traditions that thrived in the SF Bay Area in the mid-1960s: the bohemian/underground art/theater scene, and the New Left/civil rights/peace movement. The Diggers combined street theater, anarcho-direct action, and art happenings in their social agenda of creating a Free City. Their most famous activities revolved around distributing Free Food every day in the Park, and distributing "surplus energy" at a series of Free Stores (where everything was free for the taking.) The Diggers coined various slogans that worked their way into the counterculture and even into the larger society  "Do your own thing" and "Today is the first day of the rest of your life" being the most recognizable. The Diggers, at the nexus of the emerging underground, were the progenitors of many new (or newly discovered) ideas such as baking whole wheat bread (made famous through the popular Free Digger Bread that was baked in one- and two-pound coffee cans at the Free Bakery); the first Free Medical Clinic, which inspired the founding of the Haight-Ashbury Free Medical Clinic; tye-dyed clothing; and, communal celebrations of natural planetary events, such as the Solstices and Equinoxes. First and foremost, the Diggers were actors (in Trip Without A Ticket, the term "life actors" was used.) Their stage was the streets and parks of the Haight-Ashbury, and later the whole city of San Francisco. The Diggers had evolved out of the radicalizing maelstrom that was the San Francisco Mime Troupe which R.G. Davis, the actor, writer, director and founder of the Troupe had created over the previous decade. The Diggers represented a natural evolution in the course of the Troupe's history, as they had first moved from an indoor milieu into the parks of the City, giving Free performances on stages thrown up the day of the show. The Digger energy took the action off the constructed platform and jumped right into the most happening stage yet  the streets of the Haight where a new youth culture was recreating itself, at least temporarily, out of the glaring eye of news reporters. The Diggers, as actors, created a series of street events that marked the evolution of the hippie phenomenon from a homegrown face-to-face community to the mass-media circus that splashed its face across the world's front pages and TV screens: the Death of Money Parade, Intersection Game, Invisible Circus, Death of Hippie/Birth of Free. 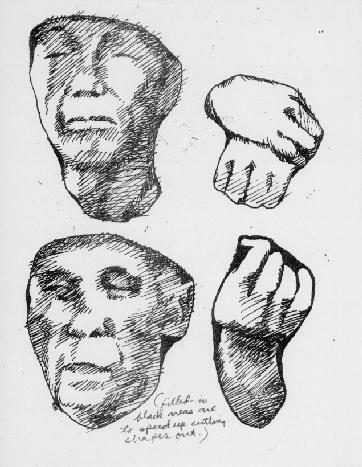 The Diggers broadcast these events, as well as their editorial comments of the day, pronouncements to the larger Hip Community, manifestos and miscellaneous communications, through broadsides and leaflets distributed by hand on Haight Street. These Web pages are my attempt to present the story of the digger movement as it developed in the mid-to-late sixties and early seventies (and evolved in various directions even to the present). I have been collecting this Archive for forty years, and see the Web as a way to display the materials and make them available both for researchers and for all diggers past and present who want to preserve and participate in this history. 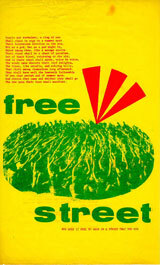 An issue of the Free City News street sheets distributed in San Francisco, 1967-68.